A Powerful Rehydrating Face Pack contains shea butter, mulberry fruit, Grape fruit, Papaya enzymes, Sun flower oil and precious herbs that help to nourish and rejuvenate the skin, provided requisite moisture, helps to make skin visibly glowing and fairer. Apply a thick layer all over face and neck.Leave on for 15 minutes. Wash thoroughly with water. Use Shea Butter moisturizer after removing face pack. 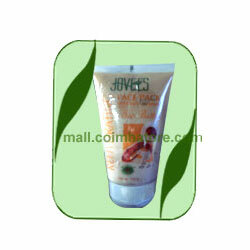 Shea butter, Mulberry fruit, Grape fruit, Pappaya enzyme, Jujebe fruit.